The torrent of clinical information being made available on smartphones does not seem to be showing any signs of slowing. Merge Healthcare just announced March 1 an iPhone OS app, available for the iPad, that connects seamlessly with their eFilm workstation to make available patients’ studies as quickly as they are accessioned by the radiology technician. Many hospitals already use the eFilm Workstation for their radiologists to view studies stored on their hospital PACS (Picture Archiving and Communication System). What this announcement means is that a physician who works at that hospital can also now immediately view those high resolution images on their iPad. While other imaging applications for the iPad and iPhone exist, such as Osirix which we reviewed previously, the advantage here is that the communication between the PACS server and the the mobile device is maintained transparently and securely by servers at Merge. I can attest that connecting Osirix to an imaging server is challenging, mostly due to the arcane requirements of the DICOM standard’s “Query & Retreive” method of communication. In exchange for this simplicity, however, the app owner is charged a $24.99 monthly subscription fee, in addition to the $9.99 purchase price. Merge also notes that this app is not intended for diagnostic use, and seemingly to reinforce this status, they have left out any measurement tools such as distance and radio-density, available on the Osirix app. The company has announced a testing partnership for their mobile platform with Massachusetts General Hospital, perhaps to bring forth more features. The eFilm Mobile app is available for download now in the App store. Separately, Merge recently announced a merger with AMICAS, another medical imaging technology vendor for $248m in cash, to form one of the largest providers in that arena. Also announced recently is AirStrip Technologies Radiology viewer. This is part of their AirStrip OBSERVER suite and thus will presumably be deployed similar to the other AirStrip apps, meaning it is installed and licensed by the hospital and provided free to physicians. Without hands-on experience, we cannot say how each application works but the two companies’ strategies are clearly distinct. Merge is offering the mobile app to enhance their workstation software while AirStrip Technologies is depending on the hospital to do the work of integrating their product into the hospital and pay for it. For specialties who rely extensively on imaging, such as orthopedics, the seamless ability for physicians to view patient studies on a smartphone is a potentially very helpful development. 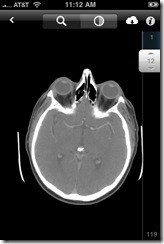 i really wanted to know about browsing JPEG nad DICOM images on ipad but never got real answer from any where. Well I have a version of EFILM which allows ipads to have access. This works well – although the registration app is a little strange – and very specific in how you have to register your ipad. Otherwise it works very well. You need to pony up 2500 dollars for the newest version of EFILM.